Cúl Camp 2018…. Thanks to Peter Williams, David Coleman and to the trainers for all of their hard work! 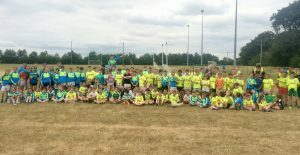 The Moorefield Football Cúl Camp takes place from Monday 9th July – Friday 13th July and the Hurling & Camogie Cúl Camp takes place from Monday 16th – Friday 20th July.